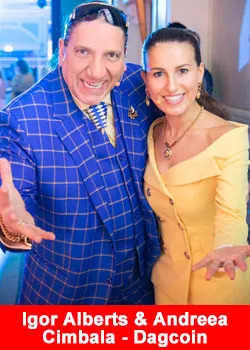 Only 4 months after their previous increase in turnover, Igor E. Alberts and Andreea Cimbala-Alberts from the Netherlands secure their position as number 1 in our Top Earners ranking again, having managed to reach the figure of $1.675.000 with Success Factory – Dagcoin*. Success Factory – Dagcoin is the Network Marketing Arm of Dagcoin. It is a step of almost half a million dollars a month above their previous billing figure, $1.2 Million per month. Many members of their team, Succes4All, are also getting higher positions in the ranking. 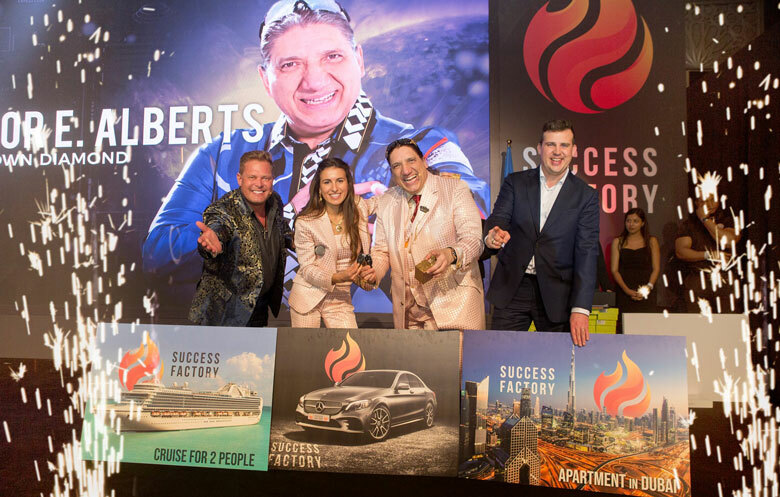 Igor and Andreea currently hold the position of Ambassadors of the company after just over a year of work, and at the recent Success Factory event in Dubai, which celebrated the anniversary of its launch, the couple was recognized, in style, for their results. As Ambassadors, these two outstanding leaders and mentors were awarded rings with an engraving that reflected that they had already exceeded the turnover of one million dollars. They were also awarded the ownership of a luxury apartment that is being built in a new residential estate in Dubai and the keys of a new Ferrari Portofino. “These moments are exciting: receiving recognition is nice and getting such special gifts is truly incredible. But we should never lose focus of what is really important. For me, the really important, the most beautiful thing about MLM is that everyone has their place in it; or, at least, everyone can find it or create it, no matter where they come from, their religion, their race, their age… And that, as an industry, has the potential to create a better world and bring people closer together. For Igor and Andreea, this success is partly the product of a personal and human understanding of the business. However, the strategy and the constant training of their teams also has a lot to do: the couple is known for their intense training and for gathering in their own home many members of their team to carry out practical workshops for several days in a row. On their experience with the company, they talk about the two faces of Success Factory and Dagcoin, the financial and the human one. “Dagcoin has a very disruptive vision of the finances of the future, and it is something that fascinates us more and more. It is not just about the currency, but about the entire system that surrounds it: they are talking about us moving to a world where it’s not only about everyone having access to banking thanks to digital payments, but also about making the world inevitably cleaner, more fair and honest through the drastic transparency of the dagchain, its low power consumption and its scalability to store data instantly. It is being talked about as a technology that could change the way the bureaucracy works in many countries. But Success Factory is not only the marketing side of the coin and the currency is not the only product of the company (it’s just the one that we are most passionate about). The company is really determined to unleash the potential of people who can find their vocation in network marketing and to give them all the necessary tools to become the best professionals on the planet. That is also a mission to which we are very committed. *Disclaimer: This is not an investment advice. We are a growing and ambitious team based in Estonia, and our goal is to provide a new alternative currency for everyday use to create a common currency. Our team is doing it by making cryptocurrency payments lightning fast, keeping the transaction fees unnoticeably low and creating a system as easy-to-use as possible. Get more information, fact and figures about DagCoin - Success Factory, click here for the DagCoin - Success Factory overview.